For over a decade, Cloud Star has been making all natural, wholesome products for dogs. It all started in 1999 with their iconic Buddy Biscuits, which are quite popular in the Lapdog household. The line has expanded over the years to include several types of treats, grooming products and "Wag More, Bark Less" merchandise (of which I own several pieces). What I love most is that all of their dog treats continue to be Made in the USA with only first-quality ingredients - my #1 priority when looking for treats for my kids! I was very excited - probably more so than the Lapdogs themselves - when we got the chance to review Cloud Star's new Dynamo Dog Functional Treats! Designed for daily support of important issues our dogs deal with, these aren't just any 'ole treats... they're little doses of health, in a delicious bite! In addition to being Made in the USA, all Dynamo treats are grain free, gluten free, all natural, and free from artificial flavors and byproducts. All flavors are available in 5 oz and 14 oz bags. We received the Skin & Coat and Tummy formulas to try. 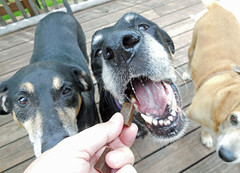 With senior dogs in our pack, digestive issues pop up more than some would like. Having a Tummy formula treat available is wonderful... and having one with pumpkin and ginger in it (two things all of the Lapdogs love) is even better! In addition to the pumpkin and ginger, Dynamo Tummy also contains probiotics and specially selected fruits, vegetables and herbs to ease digestion. The Skin & Coat formula is an excellent treat for my two skin-issue prone hounds! Made with salmon oil and Vitamin E, plus specially selected fruits, vegetables and herbs, these treats are designed to be extra tasty while providing the nutrients needed for a healthy coat. It's safe to say that all of the Lapdogs loved both flavors! Zeus and Sophie were especially interested in the Tummy variety -- which of course includes one of their most favorite foods ever, pumpkin! 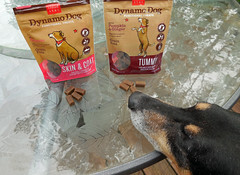 We are giving Dynamo Dog Functional Treats our Official 16 Paws Up Seal of Approval! 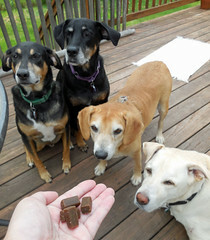 Combined with the humans 2 thumbs up, these are treats we definitely want your pack to try as well! You can get some of your very own through the Amazon link at the top of the page, or you can try to win 2 bags below! In addition to making awesome treats for our furry kids, Cloud Star is also committed to helping others! As part of their commitment to giving back, the company pledges to donate to non-profit organizations benefiting animals, women, children, and the environment. Wonderful, tasty treats and a responsible company -- what more could you ask for? 2) Leave a comment below telling us why you want to try Dynamo Dog Functional Treats and which varieties you would like if you win (winner gets 2 bags of their choice). To be eligible to win, you must be a resident of the USA and you must complete both steps above. Please be sure your entry includes a way to contact you (i.e. link to your blog or include your email address). 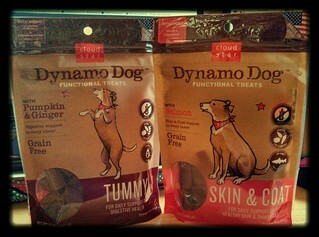 Disclosure: Cloud Star sent 2 packages of Dynamo Dog treats to Lapdog Creations, free of charge for review purposes. I was not compensated for this review and all opinions expressed are my own. Hip and joint - have an 8 year old Golden. I like their altruism! Skip us ...big sigh. Have a terrific Tuesday. Have the Lapdogs ever met a treat they didn't like? LOL! Now that we've confirmed they ARE Sissy-friendly, we'd like to try the tummy variety and the skin and coat variety. Gg's environmental allergies seem to be back, after a 3-year break. Sigh. Well, in our pack we have all those problems at least now and then. Sounds ideal for us. The dog trainer who's been helping us just told us to keep cans of pumpkin in the house in case baby Brutus has another attack of the runs (and I'm sure you know how much fun the one attack was, with a puppy who wasn't fully housetrained). Says his German Shepherd loves pumpkin. 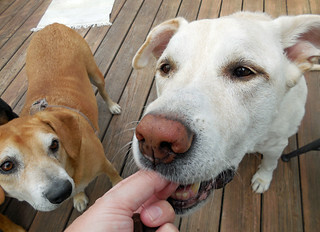 But mostly, it's nifty when a treat shows up for the Lapdogs; I'm sure they think are poor, unloved critters (HA!). We love CloudStar treats for training (except Mom rarely let's us have a whole chewy at a time... stingy), but we love them even more after learning on your blog that they donate to good causes! It's always great to see companies that have grain-free treats--especially when they give so much back to others! We're going to have to find some of those Bacon Hip/Joint ones. Big dogs like Vlad & long dogs like Barkly always need to protect their joints from day one--for the future. Tawny (Tut's look-alike) would love some tummy and skin/coat treats. Who am I kidding ... she'd love any treats! But I want to give her good ones. Hey there, I found you through the BeagleBratz, I saw that you have four beautiful faces there, I just had to stop by and take a closer look! Okays, lets see, if I am lucky enoughs to win, I would like the hip and joint since I am now havin' 'issues'. Ooh, we'd love to win some new treats! Dot (4 year old Brittany) has grain allergies and gets horrible ear infections if she eats any. So these would be perfect! Forgot to say, Dot would appreciate the Tummy treats! Yum! My Pierre is always hungry for new treats to try. If we win, we'd love to try one of each for our two bags. Thanks for the contest.